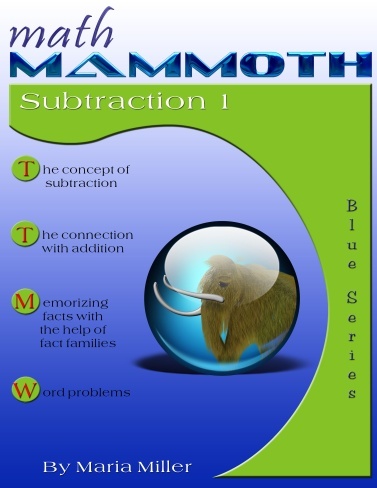 Math Mammoth Subtraction 1 deals with various concepts related to basic subtraction, and with basic addition and subtraction facts within 0-10. Most of the problems in the book only use numbers up to 10, but a few include numbers between 10 and 20. In the latter part of the book, we encounter several lessons named Addition and Subtraction Facts with... They aim at helping the child to memorize the basic addition and subtraction facts. We are approaching it from the concept of fact families. Math Mammoth Addition 1—a worktext about addition concept within 0-10, sum families (sums with 7, 8, etc. ), and word problems (grade 1). Free subtraction worksheets for grade 1 — includes single-digit subtraction, double-digit subtraction, subtracting multiples of ten, and missing number subtraction problem worksheets. My 4 year old just finished Subtraction 1. We've done Addition 1 and Place Value 1 this fall as well. He loves it! I found myself frustrated with Saxon Math K and found Math Mammoth last summer. We're going to breeze through Light Blue 1 this spring and have fun committing his math facts to memory. Thank you for a simple straightforward math program!